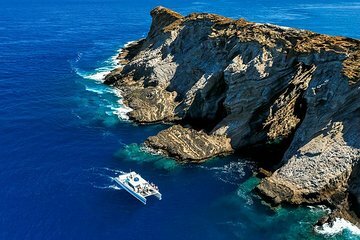 Entdecken Sie bei diesem Segel- und Schnorchelabenteuer die alten Legenden und dramatischen Landschaften der Na Pali-Küste und der „Verbotenen Insel“ von Ni'ihau. Fahren Sie entlang der hoch aufragenden Smaragdtürme und der abgelegenen Strände von Kauais atemberaubendem, rauem Ufer in einem hochmodernen Katamaran. Hören Sie von der freundlichen Crew Geschichten über die Geschichte und Mythologie Hawaiis und genießen Sie ein köstliches Mittagsbuffet an Bord. Entdecken Sie auf diesem ganztägigen Segelabenteuer die Geheimnisse von zwei der faszinierendsten Reiseziele von Hawaii. Treffen Sie sich am Morgen mit Ihrem erfahrenen Kapitän und Ihrer Crew in Port Allen. Steigen Sie an Bord eines 20 Meter langen Katamarans mit Innenkabine, Toiletten, geräumigen Sonnenterrassen und entspannenden Trampolinen, auf denen Sie sich entspannen und den Meeresnebel genießen können. Genießen Sie ein kontinentales Frühstück an Bord, während das Schiff an der nordwestlichen Küste von Na Pali von Kauai entlangfährt, die durch grüne Meeresklippen gekennzeichnet ist, die schwindelerregende Höhen von 1200 Metern erreichen, umgeben von üppigen Tälern, tropischen Wasserfällen und abgelegenen Stränden. Während Sie eine Kreuzfahrt machen, hören Sie königliche Legenden aus Hawaii, die die Küste umgeben, und halten Sie Ausschau nach reisenden Meeresbewohnern wie Spinnerdelfinen, Meeresschildkröten und wandernden Buckelwalen (Dezember bis April). Fahren Sie anschließend über einen Kanal zu den Gewässern rund um Ni'ihau, die wegen ihrer geheimen Gemeinschaft, die für alle Außenseiter geschlossen ist, als "verbotene Insel Hawaii" bekannt ist. Es ist nicht möglich, Ni'ihau zu besuchen. Bewundern Sie die Insel vom Wasser aus und erfahren Sie mehr über ihre einzigartige Geschichte und Mythologie. Schnallen Sie sich eine Schnorchelmaske und Flossen auf, um die Korallenriffe rund um die Insel und den nahe gelegenen Lehua-Krater zu erkunden, der zu den besten Schnorchelplätzen Hawaiis zählt. Ein leckeres Mittagsbuffet und Erfrischungen an Bord halten Sie den ganzen Tag über auf dem Laufenden. Bereiten Sie sich darauf vor, nass zu werden, und bringen Sie eine leichte Jacke mit, um sich auf diesem unvergesslichen Segelabenteuer wohl zu fühlen. Really fun trip. The crew was great, very engaging and professional. They had the best snorkeling location of all the tours out of Port Allen. Great experience! The snorkeling in Hawaii is not as great as it in St John. I think a lot of that has to do with the rough waters. Bring your own wet suit. We were here in April and really could have used one. The food was actually REALLY good and they had tons of it. It is definitely a must do. If you don't have the time to dedicate a day, Blue Helicopters is an amazing way to get it all in. The tour was great despite the less than perfect weather! The company was very professional and informed us ahead of time about the weather concerns and offered rescheduling/reimbursement. We stuck to our booking and enjoyed a great cruise though with more waves than expected. The view of the Na Pali coast was very impressive and the snorkling was great they even had diving glasses with prescription! What an amazing and see inspiring day! Our crew were so attentive and extremely friendly and knowledgeable of the marine life and history of the areas. We had the fortune of seeing melon headed whales, which is rare, as well as spinner dolphins and a friendly monk seal when we began our snorkel adventure. Of you have the time, highly recommend the trip to the forbidden island. The variety and amount of fish was incredible! I also recommend riding on the front of the catamaran of you don't mind getting drenched and enjoy an adventurous ride!! Would do this trip again!! We chose this over a helicopter tour and we weren't disappointed. The captain and crew were amazing! Wendel, Nicole, Drew, and Jacob are super friendly and helpful. Quick to make sure we were comfortable, happy, and safe!. Full of great tips for places to see/places to eat/things to do from a local's perspective. 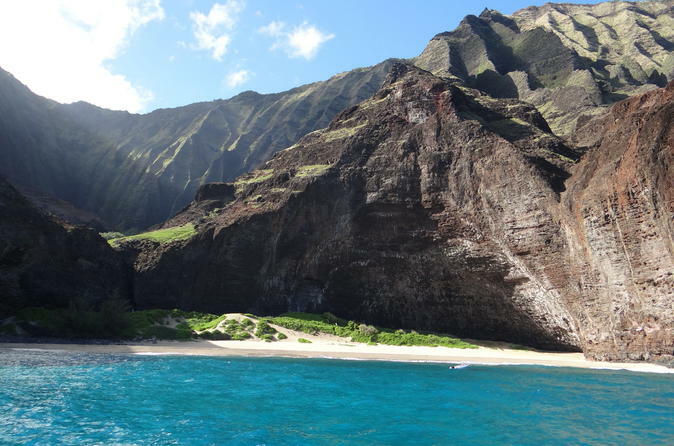 We got a great view of the beautiful Na Pali coast with some great snorkeling to boot. The ride out to and from Ni'ihau was a lot of fun! Tip - You're on the open ocean to and from Ni'ihau, so expect a bumpier ride. Sit on the front deck of the boat. You'll get wet, but A remember this is a snorkeling trip in warm/sunny Hawaii, B You're far less likely to get sea sick, C The view is better, and D Beer tastes better with a little salt spray . This cruise was truly amazing. Had to get up early but the trip especially the view of the Na Pali Coast was worth it. Holo Holo Charters, Inc staff were wonderful. Highly recommended. The crew was nice and provided good information. The food and drinks were great. The views of the Coast were really good I would have liked to go little further. Our snorkeling spot was not the best. We saw some fish and a monk seal was present when we arrived but quickly swam away. Too many people. Very friendly and helpful crew. Very cool trip program. My girlfriend and I would definitely do it again. This was truly a one of a kind experience! The scenery was amazing, the coast line was gorgeous, the staff was very knowledgeable about the area as well as the wild life, and also super friendly, good food and service, and all with a fun and enjoyable boat ride. The water was crystal clear and the captain really knew how to pick the best spot for snorkeling. We also got to se spinnner dolphins!